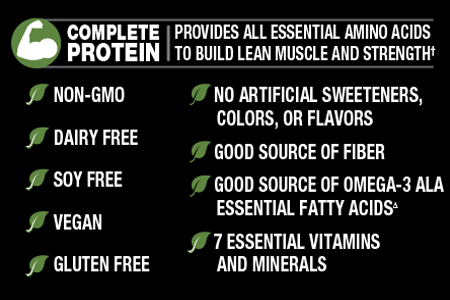 Body Fortress® Complete Plant Protein is easier to digest than whey or other milk-based proteins for those with lactose intolerance or stomach sensitivities to dairy products. A good source of fiber also helps with digestion. † use in conjunction with a daily exercise program and a balanced diet including an adequate caloric intake. Δ Provides 260 mg of ALA per serving, which is 16% of the 1.6g daily value for ALA.